The Sassafras Lounge Project was a restaurant kitchen design renovation of an existing cafe into a classic restaurant, jazz lounge and whisky bar. Menu offerings included everything from southern chops to high end single malt scotch parings. The ownership was very interested in keeping capital investment to a minimum so utilizing the existing mechanical, electrical and plumbing infrastructure was of the highest importance in order to keep construction costs down. The unique design feature of the Sassafras Lounge Project was its exposed restaurant kitchen design concept. 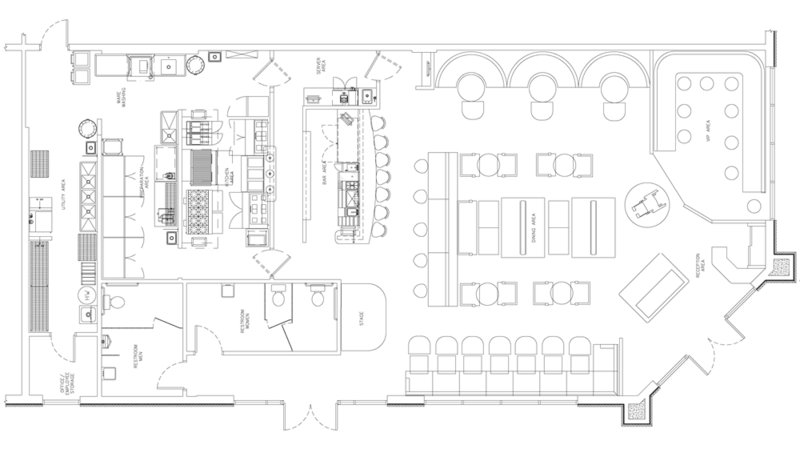 As you will see in the floor plan below, the open restaurant kitchen design creates a unified food and bar service area which increases the efficiency of the waitstaff by forming a one way circular traffic pattern that flows throughout the restaurant that reduces cross traffic and travel distance. As with every Mise Designs project, manufacturers were selected for the Sassafras Lounge restaurant kitchen design based on value and quality as opposed to specifying individual brands for each category throughout the project. This specification approach reduced total capital expenditures for new equipment by approximately $10,000. Click Here to read all about the restaurant kitchen design services we provided for the Sassafras Lounge Project.